Three spectacularly spooky looks for the holiday. One of my favorite things about Halloween (besides the candy, of course) is how it opens up an entire new pattern aesthetic for the entire two (or more) months preceding it. Suddenly, semi-gothic embellishments that are classier versions of your pre-teen emo-phase closet staples, and prints depicting things like pumpkins, spiders, cats, bats, and ghosts, are not only relevant, they’re revered. Some of my favorite brands, such as Unique Vintage and ModCloth, are pretty notorious for stocking Halloween-ready, vintage-inspired pieces that are sure to turn heads and draw stares, and this year is no different. Drawing on inspiration from three iconic Halloween aesthetics, here’s how to look cute AND creepy during Halloween season this year! This entire look is based around this pumpkin purse, which might just be the cutest thing I have ever seen in my entire life. The pattern on this festive knit dress looks like polka-dots from far away, but when you get up close, SURPRISE, they’re actually pumpkins, too! The rest of the look is all about balancing the cute with the creepy: pair some spiderwebbed black tights with some lavender heels, then darken up your typical makeup routine with some edgy black nail polish and lipstick. I don’t know who discovered that something as terrifying as spiders made such an adorable seasonal aesthetic, but I’m not mad about it. 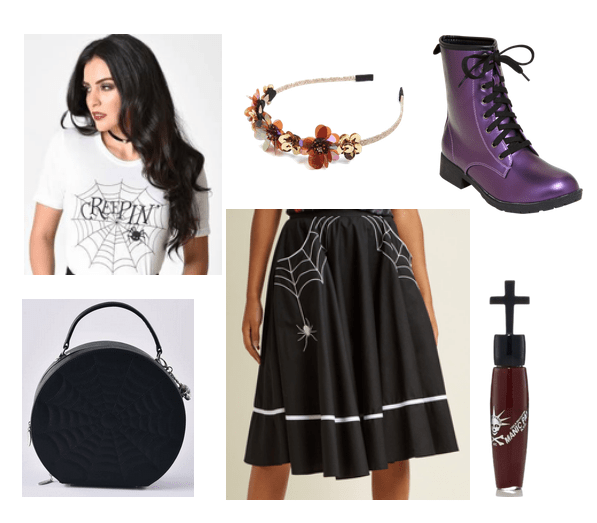 This spider-themed tee and A-line skirt combo pairs perfectly with a vintage hatbox purse and shiny purple combat boots. For the finishing touch, add a fall-floral headband and some deep red lip gloss. Alright girls, time to unleash your inner vampire. Use a solid black Peter Pan-collared dress as a base for accent pieces like this bat-shaped purse and bat-embellished flats. Add a touch of whimsy with some heart-patterned sheer tights, then accessorize with a totally unique statement piece, like this skeleton-inspired ring-and-bracelet combo. Which Halloween pattern aesthetic is your favorite? How do you celebrate this season? Let me know in the comments!